Once you have a OneLogin account, you can manage your subscription by going to Settings > Subscription in the OneLogin portal. Subscription management is available to Account Owners and Super Users. This article describes how to view and change your subscription options. For detailed information about handling unlicensed users and cleaning up your unused OneLogin user accounts, see Managing OneLogin Licenses. 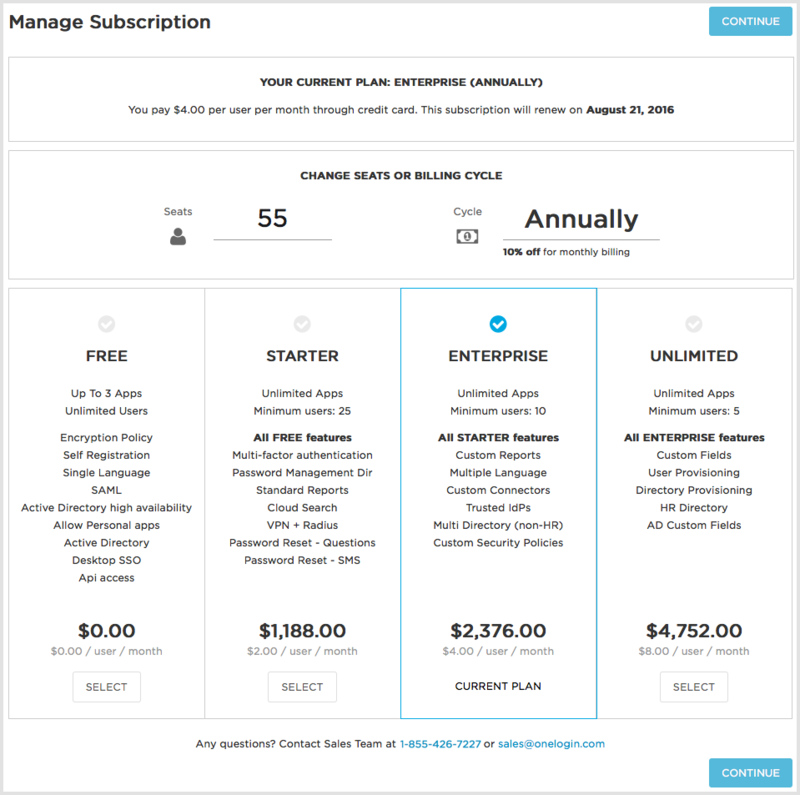 If you pay by invoice, the Subscription Summary page displays a simple overview that shows your plan, licensed users, and additional seats available. If you want to change your plan or add seats, contact the OneLogin Sales team at the phone number or email address displayed on the page. If you pay by credit card, the Subscription Summary page shows current plan info and seat utilization, as well as billing information. The costs per plan are updated as you change the number of seats and billing cycle. If you want to change plans, click Select. Note that you cannot downgrade to a more restrictive plan or a smaller number of users on this page, only upgrade. When you click Continue, you're taken to the Billing page, where you can update your billing information, make a payment, and get a receipt. You will see a verification of any changes that you make.